This is part six in our series on American hoppy ales. The first part was posted on July 28. American hoppy ales — American pale ales, American IPAs and double IPAS (dIPAs) — are a showcase for hops, and there are many ways to get hop bitterness, flavor and aroma into your beer. Since hopping is so important to these styles, here is a quick primer on ways to add hops to beer, starting with kettle additions. A hard boiling wort will isomerize alpha acids. The core of your beer’s hop character is going to come from hops added during the boil. As hops are boiled, resins called alpha acids are isomerized and made soluble. It’s the isomerized alpha acids (or iso-alpha acids) that gives beer most of it’s bitterness. (Other resins, called beta-acids also contribute slightly to a beer’s bitterness.) The longer you boil hops, the more alpha acids are isomerized, up to a point. And incidentally, it’s a common myth that non-isomerized alpha acids are not bitter. They are. Pop a hop pellet in your mouth sometime and discover for yourself. Hops added near the beginning of the boil are called bittering hops. These hops are boiled long enough — usually 60 minutes, and less frequently as long as 90 minutes — that 25–30% of the alpha acids are extracted and converted to iso-alpha acids. Boiling hops for longer periods does not significantly increase the amount of alpha acids isomerized. Although good for alpha acid isomerization, a 60-minute or longer boil volatilizes most of the hop oils, which is why one or more hop charges are usually also added later in the boil. Bittering hops are usually high-alpha hops (over 8% alpha acids). If a brewer were to select lower alpha hops, he or she would have to add more to the kettle to get the same level of bitterness. And, the extra plant material in the wort would reduce the volume of wort yielded and perhaps contribute excess tannins or lend a vegetal note to the beer. 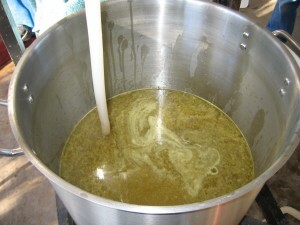 In a hop-forward beer, the aroma characteristics of the bittering hops are usually considered secondary because most of their oils will be lost in the boil. Oils from later hop additions will dominate the aroma profile. Many malt-focused beers do have a single hop addition, early in the boil, and in those beers the aroma characteristics of the hop variety are more important because some oils do remain in the wort, even after a full-length boil. Some commercial brewers use T-45 hop pellets in the boil for their most bitter beers. These are pellets from which much of the extraneous plant material has been removed. The “regular” hop pellets (T-90 pellets) that homebrewers use contain almost all of the plant material from the hop cones. Still other commercial brewers replace some or all of their bittering hop additions with liquid hop extract; this yields the bitterness they want without adding excessive plant material to their kettles. Hops are not simply carriers of alpha acids. The oils in hops give beer a pleasing, floral hop aroma. The most abundant oils in most hops are myrcene, humulene, caryophyllen and farnesene. The levels of these are sometimes noted by hop merchants, but other times only the total oil content is reported (usually in mLs/ 100 g). 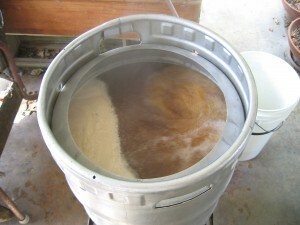 Large additions of late hops — and even hops added to the whirlpool when it is still over 185 °F (85 °C), the temperature above which alpha acids isomerize — contribute some bitterness along with their oils. In many highly aromatic hoppy beers, late addition hops can contribute almost half of the total IBUs in the beer. And of course, some homebrewers have taken late addition hops to the limit — adding all their hops around knockout in a technique called “hopbursting.” This results in a massive hop aroma. And, because of the large quantity of hops added, sufficient bitterness is obtained from a boil of a few minutes or steeping in the whirlpool before chilling. Hops boiled for for an intermediate amount of time are thought to contribute hop flavor, so many recipes also include a “flavor addition” between 30 minutes and 10 minutes left in the boil. Dissolved pellet hops in a kettle prior to the boil. Hops can be added at the beginning of the boil for maximum alpha acid extraction and at the very end of the boil (or in the whirlpool) for maximum oil retention. Using this approach, with high-alpha hops for bittering, you can get the most iso-alpha acids and oils into your wort using the least amount of hops. And, as is very common in homebrew recipes, a third hop charge may be added with roughly 15 minutes left in the boil to enhance the hop flavor. However, you don’t need to limit yourself to two (or three) hop additions. Some recipes include hop additions throughout the boil. This approach is most closely associated with Dogfish Head Brewery for their 60-minutes, 90-minute and 120-minutes beers, all of which are hopped continually throughout the boil. Critics of this method say it is a waste of hops — hops added midway through the boil do not yield as much iso-alpha acids as they could and most of their oils are lost. Proponents claim that the middle additions yield hop flavors not obtainable by adding hops at only the beginning and end of the boil. In tomorrow’s article, we’ll look at hopping outside of the boil — from pre-boil hopping (mash hopping and first wort hopping) to post-boil hopping (using hop jacks) to post-fermentation hopping (dry hopping and using “Randalls”).